Lightning, fire or water damage in the server room is every IT administrator's nightmare. Around 140,000 hard disks fail abruptly every day worldwide, destroying many petabytes of data. Every minute that companies and organizations are denied access to important business data costs money. With the SEP sesam Bare System Recovery Solution (BSR) the recovery of complete systems after a total failure is fast and simple. SEP sesam BSR enables a system to be fully operational within a few minutes after replacing a system disk or the complete computer hardware, depending on data volume, hardware and network performance. With the data protection solution SEP sesam every IT infrastructure is secured around the clock and thanks to the SEP sesam BSR technology all data and user information are completely restored after a failure. SEP sesam BSR offers the possibility to restore backup clients quickly and comprehensively without prior partitioning or installation of an operating system with a bootable SEP BSR medium. The restoration of the selected backup client is centrally controlled by the SEP sesam Backup Server. 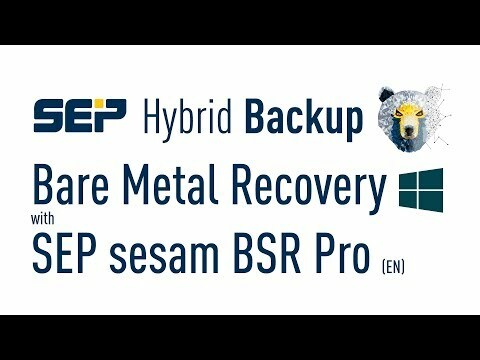 SEP bare-metal recovery solutions are fully integrated into the SEP sesam backup concept and are available for Linux and Windows operating systems. The SAP installation is something very valuable for companies and organizations. Many, if not all, important data is managed in the SAP system. SAP users have relied on SEP for years because of the importance of this data. As the first data backup solution in Europe, SEP sesam was used for an SAP installation with SAPDB on Linux and has been certified for SAP since 2002. In order to survive on the market as a company, goals such as sales growth, quality improvement and customer loyalty make a decisive contribution to the success of the company. To achieve these goals, SAP technologies are the basis of a successful company that is reliably secured around the clock with SEP sesam Hybrid Backup and kept available at all times thanks to the Bare Metal Recovery solution. Create a boot-ISO file on a reference system with SEP sesam BSR Pro and create a bootable medium. The boot ISO can be preloaded with drivers required for booting on other systems (especially storage and network drivers). Set up backups of Windows systems to the desired extent with BSR Backup Job. Plug prepared Windows boot media into the computer and boot from it. Start the wizard and select the desired backup for system recovery for recovery. After a reboot, the system is available again. Create a boot-ISO file on a reference system with SEP sesam BSR Pro. The boot ISO can be preloaded with drivers required for booting on virtual systems (especially storage and network drivers). Boot-ISO file must be able to be included on the hypervisor. Include and start prepared Windows boot media when creating a new VM. Set up backups of Linux systems to the desired extent with BSR Backup Job. The BSR backup is stored on the Linux system. An individual boot medium must now be created from this. Plug prepared Linux boot media into the computer and boot from it. The BSR backup is stored on the Linux system. An individual boot medium must now be created from this. The boot file must be able to be included on the hypervisor. Include and start prepared Linux boot media when creating a new VM.